Alzarri Joseph - a name that has been on everyone's lips ever since he set the stage alight on IPL debut to dismantle Sunrisers Hyderabad in a breathtaking spell. The 22-year-old broke a 11-year old record returning exceptional figures of 6/12, best-ever in the history of the IPL. Drafted into the Mumbai Indians side as replacement for the injured Adam Milne, Joseph was unplayable on the day, his wickets including the likes of David Warner, Vijay Shankar and Deepak Hooda. He then had a role in Mumbai's win over Kings XI Punjab on Wednesday (April 10) as well, this time with the bat. Coming in with his side needing over 13 runs an over, he thumped his first ball for a four. Kieron Pollard then took centrestage but was dismissed in the last over with Mumbai needing 4 in 4 balls to win. The equation further boiled down to 2 off 1 ball but Joseph kept his cool and punched a low full toss down to long on to hand the hosts a memorable win. “It's a great start. I couldn't have asked for anything better. I will really cherish this moment. I just wanted to go out and put all my effort. My first game, I just wanted to get in the park and get bowling," Joseph had said after his heroics in the first match. The kind of performance he put in meant the limelight was solely on him but he added that he is looking to win the tournament instead of just putting in good performances. "It's not something that I really play for. I only play for wins, not the limelight. It's a good feeling but I want to win this tournament." For many, this kind of a dream debut is a one-off performance; the kind of bowling spell one may see on occasion but not expect on a regular basis. For Joseph – someone who has been in the limelight many times in his young career – this was just another day in the office. After all, he has long been earmarked for superstardom. Ian Bishop wanted him to be fast-tracked to the Test team and he has received praise from the likes of Andy Roberts and Curtly Ambrose - all before he even turned 20 years old. A quick look at his domestic numbers show just why he’s so highly rated: In only 31 first-class games, he has taken 101 wickets at an average of 24.25. His List A figures are also impressive; in 29 games he has taken 46 wickets at an average of 28.80. He first announced himself to the world during the 2016 U-19 World Cup held in Bangladesh, which the Windies went on to win after beating India in the final. The tournament saw Joseph finish the joint-third highest wicket taker with 13 scalps to his name. He also recorded the fastest ball of the tournament with a delivery that clocked 143 km/h. 3 of those 13 wickets came in the final itself as he ran through India’s top-order. Incidentally, one of players he dismissed in that match was future Mumbai Indians teammate Ishan Kishan. But it isn’t just Joseph’s pace and talent that make him one to watch out for. There’s also the fact he has already displayed an ability to play through adversity. 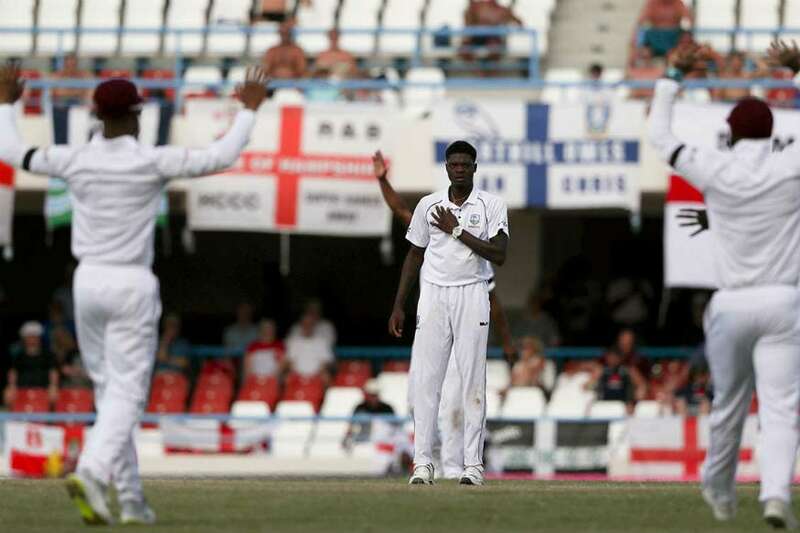 During the Windies’ second Test match against England in his home ground of Antigua earlier this year, news broke that Joseph’s mother had passed away after a long battle with illness. Amazingly he took the field thereafter, first scoring 7 runs after coming in to bat at no. 10 in the first innings and then taking 2/12 in a 7-over spell that set up the home side’s 10-wicket victory and Test series win. It’s also worth noting that prior to his debut IPL game, the pacer’s T20 record was far from eye-catching. In his seven matches before Saturday, he had taken just 9 wickets at an average exceeding 32 and an economy rate of nearly 11.5. He was even on the end of an absolute thrashing by Dwayne Bravo during a 2018 Caribbean Premier League match against the Trinbago Knight Riders. Playing for the St. Kitts and Nevis Patriots, Joseph was smashed for five straight sixes in the 19th over by the veteran all-rounder in a masterclass of power hitting. But he has clearly learnt a lot from then, something that bodes well not only for the Mumbai Indians this year but for West Indies cricket as a whole.